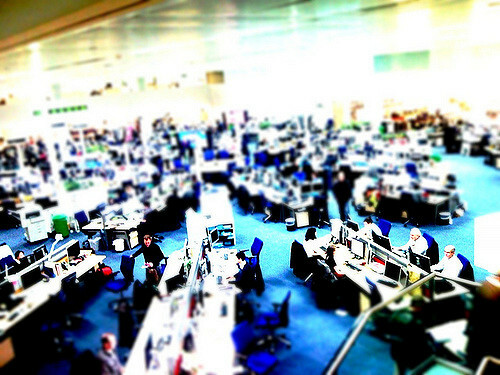 Editors are often so occupied with running the day-to-day news operation they have little time to concentrate on what their organisations should become. Yet news organisations must innovate to stay relevant to their audiences. I asked editors from several British newsrooms how they combine their day job with leading innovation. This is what I learned. The problem with innovation in the newsroom is not so much a problem of a lack of awareness or ideas, but the lack of the ability to implement an innovative strategy. This follows largely from the fact that the people most crucial for the implementation of strategy, the middle-tier editors, are often too time-strapped and ill-equipped to lead innovation. I know this since I am one of them. Last academic year I had the opportunity to be a Journalist Fellow at the Reuters Institute for the Study of Journalism in Oxford and concentrate on how we could overcome this problem. I simplified the task as one of combining the day-to-day job of journalism with the ability to lead innovation. Talking to editors from several British newsrooms (including the Independent, the Guardian, Buzzfeed and the Evening Standard) and referring to scholarship on the management of creativity I came up with six lessons any desk head or section editor should learn. These are summarised below and presented in more detail in my paper How to Lead Innovation and Still Keep Your Newsroom Working. I was surprised to note that when asked about innovation, most editors would refer to new story ideas, series, or campaigns – that is, the stuff they’ve always been doing. It seems that our day-to-day jobs tie down our imagination and we have to consciously try to see the larger opportunities our organisations may have. Brand carries with it an idea about who your audience is and what you have promised to deliver them. Once you’ve mastered point number two, you need to choose where you put your energy. No matter how big a team you have, and how efficient you yourself are, there are always more stories in the world than you will have time to cover, and more new tools to master than you will have time to learn. Thus a newsroom must be willing to leave aside stories it would have covered in the past and platforms it has deemed unimportant. Moreover, on a personal level, editors must be able to choose how they use their energy and time. Managers need to learn to manage their time, as one interviewee pointed out. Give your staffers freedom and respect their expertise, but at the same time help them use that freedom in ways that benefit the goals of the organisation as a whole. Giving up some of your control will have other benefits, too. In an old news organisation everyone pretty much followed their given brief, but in an environment where differentiation and innovation are key, you need to recognise your staffers’ talent and expertise and let them run with that. “It makes for better journalism and better distribution and a better relationship with the readers”, as an editor for a digital-only news outlet told me. In digital, there is no point for a political correspondent, for example, to be pushing the same story everyone else has – they will have to be allowed to follow their creative instincts and their “obsessions”, as one interviewee put it. Yet autonomy does not mean anarchy and it needs structures to support it. First of all, to be able to make decisions, autonomous journalists need access to information and tools and the knowledge to use them. Secondly, they need clearly stated goals as to what they are to do with their newly won freedom. Training is imperative to cultivate a culture where learning new skills in encouraged and expected. I was somewhat dismayed to find out that most editors I talked to would trust journalists to be intrinsically interested to learn new things. Conversely, I believe that journalists are, like all people, prone to falling into the comfort of repeating what they already know, and therefore it is important to create a culture of learning and progress. Being innovative and effective at the same time does not work without having clear goals, and even the clearest of goals don’t work if they are not communicated effectively. As one interviewee said, the key is “relentless communication about what matters and why.” Moreover, it is not enough that vertical communication works, newsroom managers will have to make sure communication also functions horizontally. Ville Seuri is an assistant chief subeditor for the newspaper Helsingin Sanomat and was a visiting fellow at the Reuters Institute for the Study of Journalism 2015–2016.Seuri currently works for the Finnish newspaper Helsingin Sanomat, where as one of three assistant chief subeditors, he leads a team of subeditors and layout designers in composing the news sections for the daily paper. Will Smart Speakers Disrupt The Media?